Every year, NAHB conducts a census of its builder and associate members in order to better understand the composition and characteristics of its membership. The census collects company as well as demographic information. This post summarizes findings from the 2013 Associate member census, with a more extensive article available here. An earlier post summarized findings from the 2013 Builder member census. Associate members include a wide range of supportive industries and professions including, among others, specialty trade contractors, manufacturers, retailers/distributors, designers, and architects. In 2013, associate members represented 68 percent of all NAHB’s members, while builder members made up the remaining 32 percent. 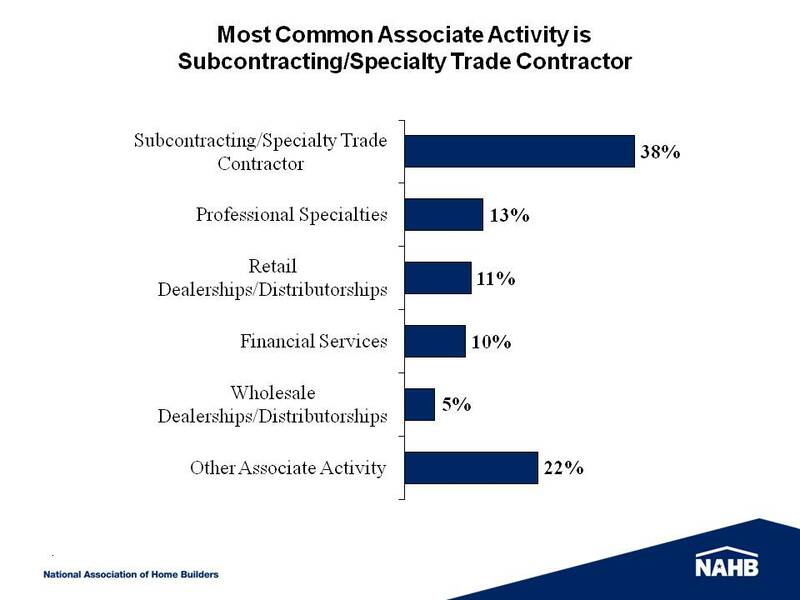 Nearly 4 out of every 10 associate members were in subcontracting/specialty trade contractors (38%). Far smaller shares were in professional specialties (13%), retail dealership/distributorship (11%), financial services (10%), or wholesale dealership/distributorship (5%). Other activities accounted for the remaining 22%, including manufacturing, real estate, and utilities. Fifty percent of associate members had fewer than 10 employees on payroll in 2013 – of these, 30% had 4 or fewer employees and 20% had 5 to 9. 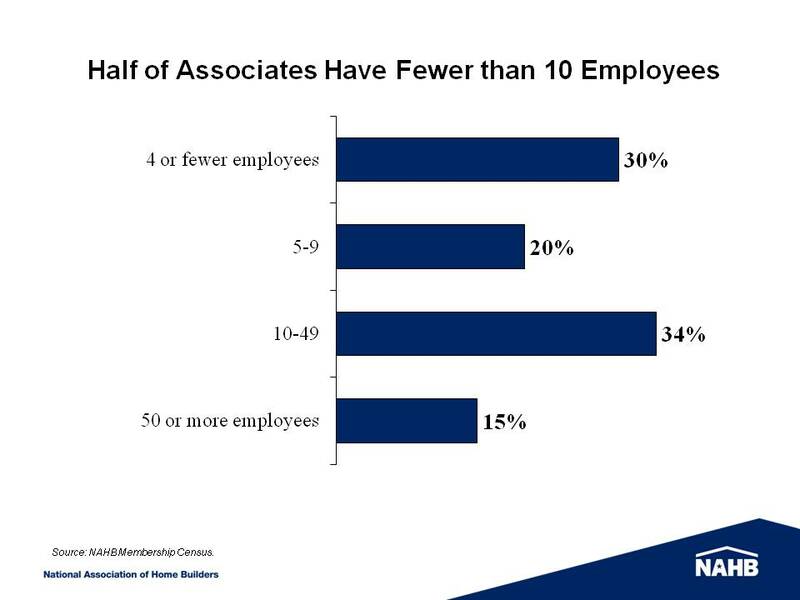 About a third of associates (34%) had 10 to 49 employees, while 15% had 50 or more. The median number of employees was 9 and the average 75. Median company revenue among associate members increased for a second consecutive year in 2013, rising to $1.8 million, from $1.3 million in 2012 and $1.1 million in 2011. The latest Census also revealed that the median associate is 54 years old, and that most are male (81%), White (96%), and non-Hispanic (97%).